The beloved little Kale plant pictured above has done us well over the two years its been in the garden. It is the last of its kind and I am hoping that eventually it will produce seeds to carry on the good will. Just prior to Christmas it was heavily, HEAVILY, invested with Cabbage Moth caterpillars. This is when the photo was taken. I was taking off about a dozen caterpillars morning and night for a couple of days and feeding them to our Japanese Quail. Quality nutrition. This year I have not sprayed for the usual caterpillar onslaught as I have not made the time and have not felt a compelling need as our boys have happily been plucking caterpillars also and feeding them to the animals. And what a year not to spray. I have never seen so many cabbage moths in our garden. In the early days of January you could look out to the garden on a sunny morning and the air was full of a couple of dozen of fluttering white wings. I also have in the back of my mind a ticking curiosity to see just what might happen if I don’t spray. What is nature going to do? In this case, what might happen was already happening. By the time I had noticed the dozens of caterpillars clinging to the kale I also noticed the presence of tiny wasps. They were already working on the job themselves. 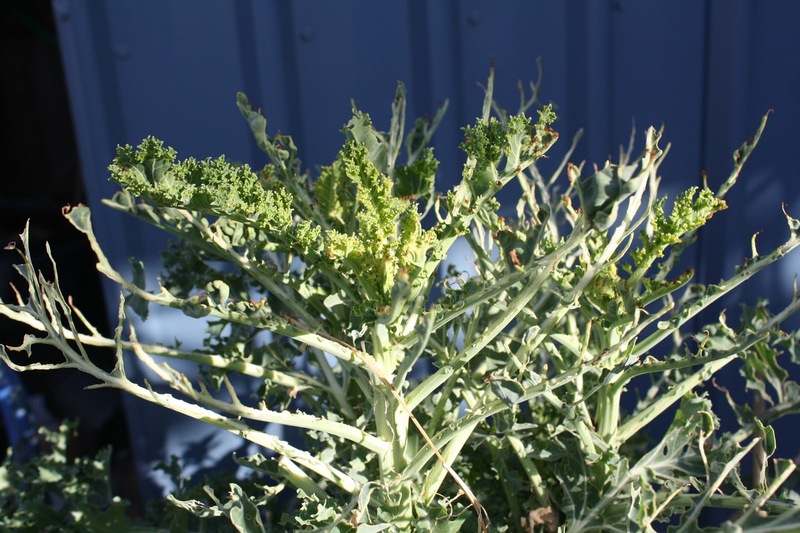 Whilst munching into the kale the caterpillars produce blends of volatile chemicals. These chemicals attract parasitic wasps. The wasps lay eggs in the caterpillars and the eggs hatch inside the caterpillars and devour their hosts from the inside. When they finally mature, the parasitic wasps emerge, killing the caterpillars in the process. It is this rather insidious method that is employed by the wasps that helps to control numbers of the butterfly and reduce further egg-laying and development of more hungry caterpillars on our kale and in the garden in general. The most astounding observation however was just how rapidly the kale bounced back from this apparent trauma. Within a week its crown was flush with new, bright green growth whilst further down its branches the last dormant remains of dying caterpillars released unto the garden a new generation of wasps to do the work I have not managed. By spraying our gardens we might eliminate the caterpillars in their early stages of development – but what then are these parasitic wasps going to feed on? We’ve eliminated a potential food supply for them. We were able to feed our quail and chickens, plus several generations of these tiny, tiny wasp that leverage the work of reducing caterpillars. Our kale has bounced back and with any luck after the experience will finally decide to share some seed!